Ladies, we are officially in month #4 of the 3in6 Challenge! Last month, I wore mini twists for three weeks and a loose bun for one week. (See the photo to the right for mini twists.) I also stayed on top of my internal regimen: intake of multivitamins, water, and veggies/fruits. 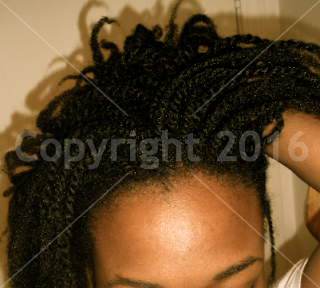 This April, I'll either do medium twists or experiment with loose twists. (If I do loose twists, I will probably write a post further explaining the technique.) Cinnamon and honey highlights update: I used the recipe twice but haven't noticed a change in hair color; it may require more uses. Ladies, have you noticed any growth or health benefits? What style will you wear in month #4? Well.... lol I wore a twist out for four days. I also wore larger twists. I did some buns, updos and flat twists. I've started redoing my hair weekly. I have been slacking on the exercising and water (as usual), but I have been eating lots of fruits and veggies. Surprisingly, I have been consistently taking my multivitamin. Oh, I also cut some knots out of my hair. This month, I have no idea. I went through so many styles last month (four is a lot for me!) because I was so BORED with my hair! From the looks of it, I'll be in twists and updos. We shall see! I haven't done medium/small twists in a while, so I'm probably going for that for April to give my hair a break (so it won't break! lol). I've been great on water, and veggies, and slacked on my vitamins (but I do drink the Emergen-C stuff which I guess suffices. I haven't started exercising as of yet, I'm feeling contrary to doing DVDs, and have given up begging my hubby to walk w/me in the evenings...he's a P90X-er. I am now looking for a meetup group for Zumba (love Zumba classes! but I also love free!!) for accountability. I hope it works out for this month. Thanks for your update and enouragement, your hair's looking great Loo! PS--I've been doing a lot of hair charity too...teaching folks on the side how to twist, style, and maintain their transitioning and all-natural hair. April will be a busy month for me in this regard, hence the need for a month-long protective style. March I went back to my weekly regimen of washing, Dc and medium twist. I really wanted to do mini twist but didn't. I also notice lots of single trand knots and my ends need to be clip. I hate it because I also noticed growth and loving it!, but feel I will lose it because I need to have a good trim. April I will try the mini twist...(that's the plan) and if I can hold out unitl the end of this challenge to not trim my ends. The same for veggie and water intake I notice if i'm on my regimen everything is fine, but one little thing will change everything. (which is sad on my end). I love the challenge and really looking to do month-long protective styles or at least 3-weeks. For March I had Crochet braids which I'll be taking down this weekend making it 5 weeks since they were in. I've gotten about 1/2 - 3/4 inches of growth so I'm happy with that especially since I cut off an inch of damaged ends just b4 I put them in. I'm due for an Aphogee so I'll do that and then I'm torn between another round of crochet braids or yarn braids for the next 5 - 8 weeks. As for my healthy body reggie, I was out of the gym for about 3 weeks and started back 2 weeks ago so I'm good...I just need to incorporate alot more healthy eating on weekends since I tend to lose focus on weekends! You're welcome and Thanks. Hair charity - Love it! Great job. Great job and glad you're enjoying the challenge. Keep it up! That's great growth! Keep it up. I don't know how I missed this post, but funny enough I was looking for the May one. Anyway, due to a mishap with my left hand in March, any attempts to do my hair consistently were null and void. Fortunately I had braided my hair, but these needed to be removed. Once they were, I went to the salon to blow dry and flat iron on 240 (gasp, I know, but I was desperate). After 1 week it was professionally rebraided in cornrows and that lasted about 3 weeks. I can since use my hand, but won't be installing extensions for now, only in the winter. So right now my protective style is 2 cornrows and that works for me. I am also elated to write that I had no heat damage having used Aveda Brilliant Damage and Giovanni Straight Hair Elixir. Compared to last year when my protective styling was minimal, my hair has flourished. The stylist who did my hair asked me if I had a rinse in it. I don't, but I suspect that because I DC with honey and olive oil (added to Shea Moisture), my straightened hair had a noticeable shine. I continue to maintain my water, vitamin and iron intake along with a balanced diet of fruit, vegetables, grains and fish or organic chicken. Glad to hear that your hair is flourishing and sustained no heat damage. Yay! :o) Thanks for checking in!